Would you pay over $12 million for an Aston Martin Valkyrie build slot? The Aston Martin Valkyrie is one of the most hotly anticipated hypercars of recent years, but if you want one you’re out of luck. That’s because Aston Martin is only building 150 examples, and they’ve all been allocated. Inevitably, it hasn’t taken long for someone who was lucky enough to secure a reservation to cash in on the demand as a build slot for a Valkyrie scheduled for delivery in 2019 has popped up for sale on Pistonheads. Unsurprisingly, Aston Martin isn’t too happy about the situation. The listing states the Valkyrie build slot is being sold on a price on request basis, but the same listing posted on Twitter reveals a whopping asking price of €9,999,999 ($12.9 million). After being notified about the listing on Twitter, Aston Martin’s CEO Andy Palmer responded, promising to cancel reservations from customers who are looking to make a tidy profit from the Valkyrie rather than experience its driving pleasure. “I doubt they have a slot, but if they do and we identify who flipped, they lose the car,” he said. “If they flip, then they never get another special”. And that would be a crying shame, because you would then lose the opportunity to own the most radical car Aston Martin has ever built. 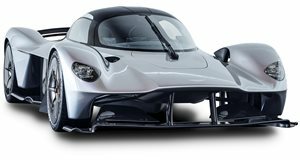 Developed in collaboration with Red Bull Racing, the Valkyrie is rumored to pack a monstrous 1,130-hp courtesy of a 6.5-liter naturally aspirated V12 engine developed by Cosworth that's mated to an electric motor. With a curb weight of 1,030 kg, it also allegedly has a power to weight ratio better than 1:1. Deliveries of the 150 road-going models planned for production will start in 2019, while 25 track-only Valkyrie variants will ship out next year.